This species is accepted, and its native range is W. Tropical Africa to NW. Uganda. Shrub or small tree 2–12 m. high (said in F.C.B. to reach 20 m.). Bark grey to brown or almost black. Young branchlets rather densely pubescent. Leaves with petiole and rhachis eglandular, the latter (10–)13–29 cm. long. Leaflets in usually 4–12 pairs (to 14, fide I.T.U. ), petiolulate, elliptic to ovate-elliptic or sometimes obovate-elliptic, (2.5–)3.5–9.5 cm. long, 2–5 cm. wide, densely appressed-puberulous beneath, ± crisped-puberulous above. Racemes 15–42 cm. long, pendulous, mostly simple, single and lateral. Bracts persist-ing till the flowers are open. Petals yellow, (1–)2–3.5 cm. long, (0.7–)1–2.5 cm. wide. Stamens 10; filaments of 3 lower each with an S-bend near base, without a swelling above. Pods cylindrical, 30–90 cm. long, 1–1.7 cm. in diameter, glabrous, blackish-brown, cylindrical, transversely but not longitudinally partitioned within. Seeds not embedded in pulp, brown, ellipsoid or ovoid-ellipsoid, 8–9 × 4.5–7 × 2.5–4 mm., with slight reticulate cracking. Wooded grasslands; ± 1070 m.
Cassia javanica Sieber ex Benth. Steyaert in Fl. Congo Belge 3: 500. Steyaert in Flore du Congo Belge et du Ruanda-Urundi, 3: 500 (1952). W.J. Eggeling, Indigenous Trees of the Uganda Protectorate, ed. 2: 60, fig. 13 (1952). Bak. 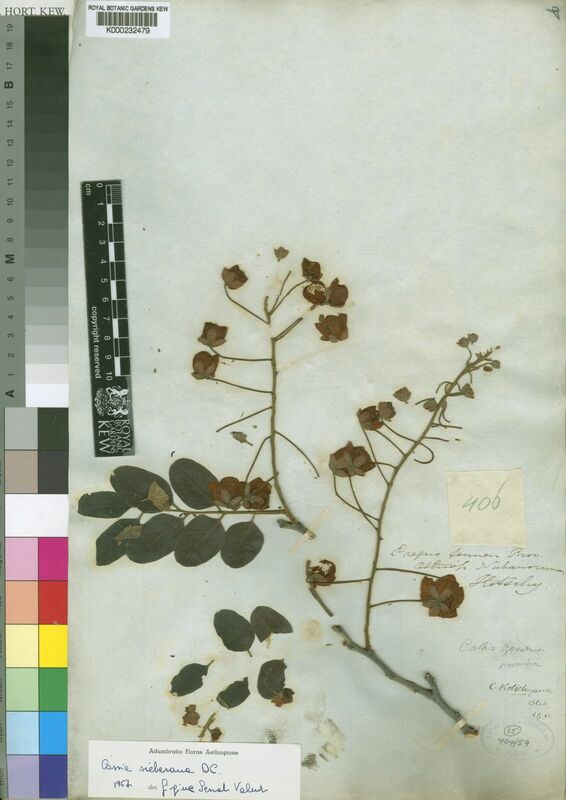 f., Leguminosae of Tropical Africa: 632 (1930). DC., Prodr. 2: 489 (1825).